November nights in Dunganny with its’ wide-open expanses tend to chill even the hardiest of souls but on Wednesday evening as the clock ticked past 21:00 there wasn’t one person from Seneschalstown complaining of the chill in the air as they witnessed a performance from their U-13 side which warmed their hearts. As the two sides jogged onto the pitch before the final, any neutral present would have thought a mistake had been made in the fixture making. 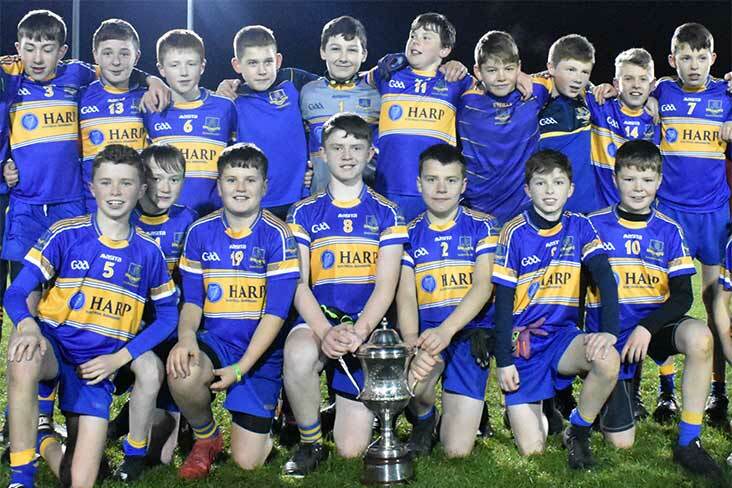 Ratoath had a team packed full of players who wouldn’t have looked amiss playing U-15 Football, while Seneschalstown, despite having players who are part of the clubs U-15 panel, were diminutive in size by contrast. The boys from the banks of the River Boyne were not cowed by this though and clearly relished the opportunity to prove that while they were giving away inches to their opponents, they were not going to let that put them off. In any final there is going to be a key moment on which a game can change in an instant and in this match, it can be reflected that Alex Finnegan on the stroke of half time refusing to allow a ball which appeared destined to go wide, go over the line proved to be the crucial play. Finnegan somehow managed to stretch every sinew of his body to palm the ball back into the path of Sam Kirwan who finished with aplomb to the back of the Ratoath goal. This pushed Seneschalstown three points clear, 1-06 to 1-03 and no sooner had the ball nestled in the net before Paul Mooney sounded the half time whistle. At the time it felt like it could be a crucial score and so it proved as it appeared to knock the stuffing out of Ratoath who while they tried valiantly in the second half never managed to get going and could only muster a solitary point while Seneschalstown were able to keep the scoreboard ticking over. Seneschalstown it was who were quickest out of the traps when midfielder Darren O’Brien pointed from play in the second minute but Ratoath, wearing a green and white strip due to a colour clash between the sides, soon cancelled this out with a pointed free. O’Brien’s centre field partner Cian Commons was next to raise a white flag when pointing before Sam Kirwan who was to end up with 1-04 to his name grabbed his first point. The excellent Luke Healy in goals then showed his worth when showing good reactionary instincts to palm a goal effort over his crossbar. The action was intense and frantic with both teams showcasing their abilities and after Kirwan picked off a fine point after being picked out with an excellently weighted pass from Eamon Finnegan, Ratoath hit the front when one of their forwards latched onto a ball in behind the Seneschalstown defence and unleashed an unstoppable volley which gave Healy no chance of stopping. Seneschalstown, wearing bibs due to the aforementioned colour clash, responded impressively to this setback with points from their hardworking wing forwards, Finnegan and Kirwan. Throughout this period their defence was standing up well to pressure from the Ratoath forwards with Josh Keating and Oran Lawlor impressive in the full back line while the half back like of Connor Rooney, Danny Waters and Séimí Byrne were on overdrive snuffing out attack after attack while also helping to create overlaps going forward when the opportunity arose. Up front the Finnegan cousins (Alex, Eamon and Robbie) were always threatening and were ably assisted by Joe Norris and Kirwan. A twenty-second Ratoath point looked like sending the teams in at the half time break of play on level terms but the never say die attitude of Alex Finnegan ensured that last opportunity for Sam Kirwan and he finished the goal chance with aplomb to leave the score reading Seneschalstown leading by three points at half time, 1-06 to 1-03. As the play resumed for the second half it felt like the opening score would be crucial, a score for Ratoath might settle them after the hammer blow of conceding the goal with the last kick of the first half but a Seneschalstown score might help them pull away. Ratoath it was who managed to score it when pointing in the second minute, but it failed to be the fillip they needed and indeed proved to be their last score of the game, thanks in the main to some brilliant tackling from the Seneschalstown defenders who put their bodies on the line time and time again. At the other end of the pitch meanwhile they managed to keep the umpires busy with points being tagged on at regular intervals. Commons kickstarted the second half when sending over another fine effort before Robbie Finnegan announced his arrival on the scoring front as he sent over a hat-trick of points between the thirty-eighth minute and the forty-fourth, two of them from frees. Kyle Hosie, eager to get in on the act after being introduced as a substitute was next to score before fittingly Sam Kirwan closed out the scoring when sending over yet another point from play. Best for the winners were Luke Healy, Danny Waters, Cian Commons and Sam Kirwan. On a night when Paul Mooney was worked a little bit harder than would be the norm at U-13 level, it would be remiss not to compliment the Syddan official on his performance. While the on-field temperature was often simmering he ensured it never boiled over. Seneschalstown (13 a-side): Luke Healy; Oran Lawlor; Josh Keating; Connor Rooney; Danny Waters; Séimí Byrne; Darren O’Brien (0-01); Cian Commons (0-02); Eamon Finnegan (0-01); Joe Norris; Sam Kirwan (1-04); Robbie Finnegan (0-03, 0-02 Frees); Alex Finnegan. Substitutes: Ciaran Collier; Liam O’Reilly; Tommy Walsh; Alex Sheridan; Ben Lynch; Sean Reilly; Josh Barry; Kyle Hosie (0-01); Tadgh Lenehan; Colin Scanlon; Peter Geraghty; Sean Davis; Liam Dillon; Jack McDonnell, Rían Carolan.